This scooter was being ridden dangerously through Arbury today. Earlier today a scooter screamed past me as I was cycling home. A older teen was driving and an apparently younger boy, without a helmet, was clinging onto the back. The passenger was highly animated and shouting. As the bike tore down Carlton Way; not excessively fast but making a lot of noise, the vehicle sounded as if it was being pushed to its limits. Before turning into Brimley Road the bike’s rider started hooting his horn excessively, clearly not worried about drawing attention to himself. The youths pulled up in Redfern Close and used the footpath to Arbury Court. I took a look at the bike, registration AE 57 FWK, and was amused to find it was, appropriately named a JM Star “Madness” with the word “Madness” emblazoned down the side. Unlike a couple of the scooters I’ve seen being ridden dangerously before in Arbury this one had its ignition intact and was apparently being driven using the key. I saw the pair again later; they returned from the shops and threw their shopping bags on the pavement on Redfern Close as they packed some of their shopping under the seat of the bike. They drove off with the passenger still without a helmet and now holding on with only one hand; he was holding a bag of shopping he out to one side of the bike with the other. This kind of thing is a common occurrence in the lawless areas in the north of the city. I have tried to urge councillors, the police, and relevant city council staff to take an interest but they don’t appear to consider what’s going on much of a problem. Youths know that the police won’t take any serious action against them. They know that they will not be treated as I expect I would if I was to brazenly break the traffic laws. They know they won’t be stopped and fined or put in front of magistrates who might take their license away (or delay them getting one). These youths know that if they’re caught at all they’ll probably dealt with under their own law; the new-Labour “Anti-Social Behaviour Act”. Or if not the ASB act, Section 59 of the Police Reform Act youths are aware that under this latter act, in first instance they’ll be given a warning, and only if they’re caught twice doing the same thing will they face having their bike confiscated. This latter act focuses on “Vehicles used in manner causing alarm, distress or annoyance”; I feel this is behind the police’s odd approach which appears blind to the fact that having kids speeding round the pavements, paths and roads of the city on bikes, sometimes without helmets, and some of them being far too young to ride legally is dangerous. At area committees the police say that these are youths who are merely annoying residents with the noise, the police appear not to grasp they’re putting their, and others’ lives and limbs at risk. Even the case of a youngster on a bike seriously injuring themselves when colliding with a bus in the south of the city hasn’t changed the police view. Just before Christmas a hundred or so pupils from Chesterton Community College gathered on Stretten Avenue to watch youths recklessly ride mopeds and other bikes; pulling wheelies – sometimes to show off and sometimes apparently as a result of having little control over their bikes. Last year mini-motos and children’s quad bikes were in regular use on the streets of the area. 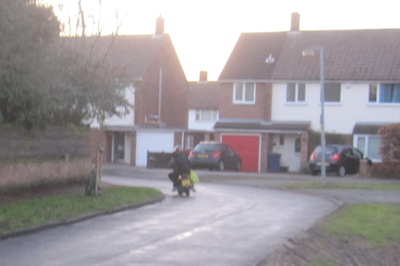 I have seen some very young children; as young as eight or so riding bikes at 20-30 mph on the streets of Arbury. Some of my neighbours have given up reporting what’s happening; due to inaction by the police – or worse than inaction – investigating those reporting what’s happening. If I reported what happened to the police I’m almost certain that if any action was taken it would involve me getting a knock on the door from a couple of PCSOs, and not a police officer going round to whoever the bike is registered to and having a word; and perhaps letting the mother of the child who’d been precariously riding on the back of the bike know about the risks he had been taking. “Anti-social behaviour affecting St Lukes School and surrounding area” is a current local police priority, it was set at the North Area Committee in November 2009. The bike I saw today came from the direction of St Luke’s School; and as a result of the priority a City Council CCTV camera is on Frenchs’ Road. I will write to the council to see it collected any evidence. The council won’t proactively release images to the police though, the police will have to take an interest and contact them. The priority, at Cllr Todd-Jones’ request, is supposed to involve the police trying to restore local residents’ view of the police which has been damaged by recent lack of action and manner in which contact has been dealt with. I’ve not seen any evidence of that happening. Shopping bags discarded on Redfern Close by the scooter riding youths. I’ve been investigated twice by Cambridgeshire police once for reporting a burglary (and not signing a dodgy statement which had been written for me) and once for taking some photos out my front window of some pretty dangerous scooter riding (on the pavements while young children were being taken home from school). Since that latter case the police have changed their stance on those photographing what they call “Anti-Social Behaviour”; but I’m not sure the message has got through to individual officer, who told me I might have to go to court to justify any photo I took. The officer, PC Simon Railer, gave a presentation to the West/Central area committee on the 20th of August 2009, and I asked him if he now accepted that there was nothing wrong with people taking photographs as evidence of problems but he declined to answer. Sections 16 and 17 of the 1988 Road Traffic Act along with the The Motor Cycles (Protective Helmets) Regulations 1998 require both the driver and passenger of motor cycles [including scooters] to wear approved helmets. If a passenger under 16 is the one without a helmet then the driver is the one responsible. 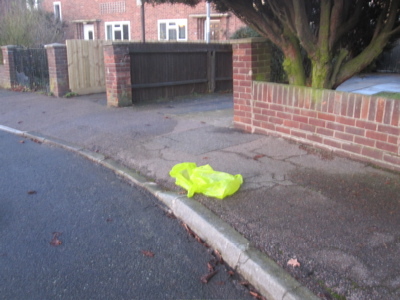 Littering is contrary to Section 87 of the Environmental Protection Act 1990. Unlike the ASB act or S.59 of the Police Reform Act these laws draw the line between legal and illegal clearly. They do not ask PCs and PCSOs to make a subjective judgement on if someone’s behaviour is “criminalish” enough to warrant action. Arbury Vandals Force Playground and Path Closure – May 2009 mini-moto riders and others force the closure of the St. Lukes School grounds. Sgt. Wragg tells the North Area committee that problems at St. Luke’s School are only a “perception” in the mind of Mr Dunn, the chair of governors at the school – November 2009 . Asking Questions About The Police’s Attitude to Photographers in Cambridge – West Central Area Committee, August 2009. Police Stopping People Taking Photographs in Public Places – May 2009. Taking Photographs of Anti-Social Behaviour – October 2007. North Area Committee Meeting – April 2008. Mini-Motos in Arbury – March 2008, Mini-moto riders get away from PCSO Streater. 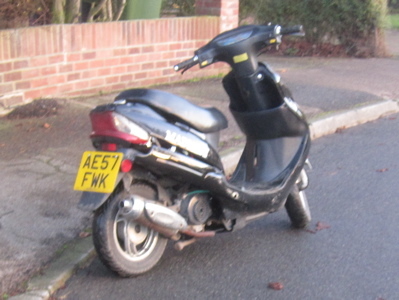 This entry was tagged Arbury, mini-moto, Police on February 5, 2010 by Richard Taylor. I have written to the City Council’s ASB team to draw their attention to this article. I have written to ask the council’s CCTV manager if the city’s camera on Frenchs’ Road has captured anything worth asking the police to look at. I’ve just read your other article about lawlessness in Arbury. Good luck getting an adequate response from the council, I failed to get action last year over bonfires on Midsummer Common. I got the feeling that the problem was partly mine, when told I should attend a problem resolution meeting with the perps. Instead I suggested that the authorities needed to say ‘no’ to wrong behaviour, but this sort of straightforward action seems to be beyond those ‘in authority’ these days, in fact they aren’t ‘in authority’, because they refuse to exercise any authority or leadership. This morning I received a “HM Government” leaflet titled: “Tackling Anti-Social Behaviour”. It appears they’ve been distributed accross Cambridge; Looks like they’ve been air-dropped in places : http://twitpic.com/11o9at !